The Federal Constitutional Court (German: Bundesverfassungsgericht; abbreviated: BVerfG) is the supreme constitutional court for the Federal Republic of Germany, established by the constitution or Basic Law (Grundgesetz) of Germany. Since its inception with the beginning of the post-WW2 republic, the court has been located in the city of Karlsruhe—intentionally distanced from the other federal institutions in Berlin (earlier in Bonn) and other cities. The main task of the court is judicial review, and it may declare legislation unconstitutional, thus rendering them ineffective. In this respect, it is similar to other supreme courts with judicial review powers, yet the court possesses a number of additional powers, and is regarded as among the most interventionist and powerful national courts in the world. Unlike other supreme courts, the constitutional court is not an integral stage of the judicial or appeals process (aside from cases concerning constitutional or public international law), and does not serve as a regular appellate court from lower courts or the Federal Supreme Courts on any violation of federal laws. The Basic Law of the Federal Republic of Germany stipulates that all three branches of the state (the legislature, executive, and judiciary) are bound directly by the constitution in Article 20, Section 3 of the document. As a result, the court can rule acts of any branches unconstitutional, whether as formal violations (exceeding powers or violating procedures) or as material conflicts (when the civil rights prescribed in the Grundgesetz are not respected). Constitutional complaint: By means of the Verfassungsbeschwerde (constitutional complaint) any person may allege that his or her constitutional rights have been violated. Although only a small fraction of these are actually successful (ranging around 2.5% since 1951), several have resulted in major legislation being invalidated, especially in the field of taxation. The large majority of the court's procedures fall into this category; 135,968 such complaints were filed from 1957 to 2002. Abstract regulation control: Several political institutions, including the governments of the Bundesländer (states), may bring a federal law before the court if they consider it unconstitutional. A well-known example of this procedure was the 1975 abortion decision, which invalidated legislation intended to decriminalise abortion. Specific regulation control: Any regular court which is convinced, that a law in question for a certain case is not in conformance with the constitution must suspend that case and bring this law before the Federal Constitutional Court. 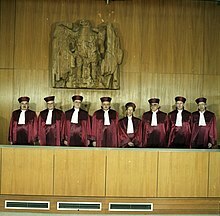 Federal dispute: Federal institutions, including members of the Bundestag, may bring internal disputes over competences and procedures before the court. State–federal dispute: The Länder may bring disputes over competences and procedures between the states and federal institutions before the court. Federal election scrutiny: Violations of election laws may be brought before the court by political institution or any involved voter. Impeachment procedure: Impeachment proceedings may be brought against the Federal President, a judge, or a member of one of the Federal Supreme Courts, by the Bundestag, the Bundesrat or the federal government, based on violation of constitutional or federal law. Prohibition of a political party: Only the Constitutional Court has the power to ban a political party in Germany. This has happened just twice, both times in the 1950s: the Socialist Reich Party (SRP), a neo-Nazi group, was banned in 1952, and the Communist Party of Germany (KPD) was banned in 1956. In the case of a third political party, the National Democratic Party of Germany (NPD) has been brought by many other political parties before the court on more than one occasion. Due to logistical reasons, however, all of these attempts have failed. The court opted to rule that NPD was constitutional in 2003 after it was learned that the German federal government had injected many of its officials as spies into the party for surveillance and security. Three judges objected to continuing which was sufficient as banning a party requires a two-thirds majority. The court itself did not choose to ban the party. In another instance, back in 2016, it was decided by the second senate of the Federal Constitutional Court that the appeal to ban NPD should be rejected because the party itself had such a small proportion of support and influence that it could be sufficiently argued that it was virtually nonexistent at any level of government in the country. Banning NPD was subsequently seen as pointless since it was believed that what few supporters that it had would either (a) proceed to form a new political party with a different title or (b) move to support the Alternative for Germany Party (AfD) - another far-right political party in Germany which is more popular than NPD and is quite arguably seen by many people as constitutionally antithetical. Despite this particular attempt at trying to ban the party, however, the Federal Constitutional Court did openly assert that NPD is unconstitutional due to the contents of its ideology and manifesto - even going as far as to say that the political party should not receive any state funding grants to garner support and influence for its causes. No further attempt has since been made to ban the National Democratic Party of Germany. Up to 2009, the Constitutional Court had struck down more than 600 laws as unconstitutional. The court consists of two senates, each of which has eight members, headed by a senate's chairman. The members of each senate are allocated to three chambers for hearings in constitutional complaint and single regulation control cases. Each chamber consists of three judges, so each senate chairman is at the same time a member of two chambers. Decisions by a senate require a majority. In some cases a two-thirds vote is required (§ 15 IV 1 BVerfGG). Decisions by a chamber need to be unanimous. A chamber is not authorized to overrule a standing precedent of the senate to which it belongs; such issues need to be submitted to the senate as a whole. Similarly, a senate may not overrule a standing precedent of the other senate, and such issues will be submitted to a plenary meeting of all 16 judges (the Plenum). Unlike all other German courts, the court often publishes the vote count on its decisions (though only the final tally, not every judge's personal vote) and even allows its members to issue a dissenting opinion. This possibility, introduced only in 1971, is a remarkable deviation from German judicial tradition. One of the two senate chairmen is also the President of the court, the other one being the Vice President. The presidency alternates between the two senates, i.e. the successor of a President is always chosen from the other senate. The 9th and current president of the court is Andreas Voßkuhle. The Constitutional Court is able to actively administer the law and ensure that political and bureaucratic decisions comply with the rights of the individual enshrined in the Basic Law. Specifically, it can vet the democratic and constitutional legitimacy of bills proposed by federal or state government, scrutinise decisions (such as those relating to taxation) by the administration, arbitrate disputes over the implementation of law between states and the federal government, and (most controversially) ban non-democratic political parties. The Constitutional Court enjoys more public trust than the federal or state parliaments, which some say derives from the German enthusiasm for the rule of law. The court's judges are elected by the Bundestag (the German parliament) and the Bundesrat (a legislative body that represents the sixteen state governments on the federal level). According to the Basic Law, each of these bodies selects four members of each senate. The election of a judge requires a two-thirds vote. The selection of the chairman of each senate alternates between Bundestag and Bundesrat and also requires a two-thirds vote. Until 2015 the Bundestag has delegated this task to a special committee (Richterwahlausschuss, judges election committee), consisting of a small number of Bundestag members. This procedure has caused some constitutional concern and was considered to be unconstitutional by many scholars. In 2015 the Bundesverfassungsgerichtsgesetz (law code of the Federal Constitutional Court) was changed in this aspect, ruling that the Bundestag elects judges to the court by secret ballot in the plenum, requiring a candidate to get a two-thirds majority, that has to equal at least an absolute majority of members of the Bundestag. The Richterwahlausschuss now only has to nominate a candidate. This new procedure was applied for the first time in September 2017, when Josef Christ was elected to the first senate as the successor of Wilhelm Schluckebier. In the Bundesrat, a chamber in which the governments of the sixteen German states are represented (each state has 3 to 6 votes depending on its population, which it has to cast en bloc), a candidate currently needs at least 46 of 69 possible votes. The judges are elected for a 12-year term, but they must retire upon reaching the age of 68. A re-election is not possible. A judge must be at least 40 years old and must be a well-trained jurist. Three out of eight members of each senate have served as a judge on one of the federal courts. Of the other five members of each senate, most judges previously served as an academic jurist at a university, as a public servant or as a lawyer. After ending their term, most judges withdraw themselves from public life. However, there are some prominent exceptions, most notably Roman Herzog, who was elected President of Germany in 1994, shortly before the end of his term as president of the court. The court's head is the President of the Federal Constitutional Court, who chairs one of the two senates and joint sessions of the court, while the other senate is chaired by the Vice President of Federal Constitutional Court. The right to elect the President and the Vice President alternates between the Bundestag and the Bundesrat. If the President of the Federal Constitutional Court leaves office, i.e. when his or her term as judge at the court ends, the legislative body, whose turn it is to choose the President, has to elect one of the judges of the senate, of which the former President wasn't a member, with a two-thirds-majority. The same applies, if the office of Vice President falls vacant. The given legislative body is free to elect the judge it prefers, but since 1983, the sitting Vice President has always been elected as President. As he or she is the highest ranking representative of the judicial branch of government, the President of the Federal Constitutional Court ranks 5th in the German order of precedence. 1993 2 BvF 2/90 (None) The federal lawmakers permitted abortion within twelve weeks after implantation. To be legal the expectant mother had to go to a pregnancy consultation minimum three days in advance and the abortion has to be their own decision. If a pregnancy is not the result of a criminal interaction or a threat to the mother's life an abortion violates the right to life of an embryo. As a result, in the last case, abortion has to be prohibited. Following the decision the lawmakers changed the criminal law. They prohibited abortion within twelve weeks but after using a pregnancy consultation all participants go unpunished. Human dignity is absolute. All fundamental rights are substantiations of human dignity therefore there is no trade-off of human dignity and any fundamental right possible. The case was remanded to the Federal Court of Justice for a second time. After Benetton II the plaintiff abandoned the lawsuit. A final decision was unnecessary. 2006 1 BvR 357/05 civil aviation security act decision The federal lawmakers permitted the shoot-down of civil airplanes if there is an indication, that it will be used as a weapon against human lives and a shoot-down is the last resort. Human dignity is inviolable. There cannot be any trade-off of lives of innocent people. Military can be used as disaster relief, but the use of military weapons violates the constitution. Only the federal government can order the military to disaster relief. The disputed part of the civil aviation security act was declared void. Basically the court decided that a shoot-down could be legal if a flight vehicle is unmanned or there are only suspects on board. 1957 1 BvR 253/56 Elfes-Decision (Elfes-Urteil) The left-wing party member of the centre-right CDU Wilhelm Elfes was accused of working against the constitution but therefor was never convicted. Based on this indictment he was denied a passport multiple times. Elfes litigated against the decision. The right to personal liberty is to be construed in a broad way. Elfes lost his specific case but the court cemented personal liberty in general. Justice Heck defined the limits of the court relative to the specialised court system. 1958 1 BvR 400/51 Lüth-Decision (Lüth-Urteil) The court of Hamburg prohibited Erich Lüth to call for boycott of the movie Immortal Beloved. Lüth justified his action because director Veit Harlan also was responsible for the antisemetic movie Jud Süß in 1940. With the Lüth-Decision the court defined and restricted its own power. But on the other hand it expanded the effective range of the Basic Law beyond the tension of government and people to the private law. The Basic Law does not bind citizens but it binds the lawmakers in creating private law and the judiciary in interpreting it. Personal freedom under modern conditions depends on the right to be protected against unlimited data processing, use, collection, storage and disclosure. There is nothing like irrelevant data. The publishing of an opinion of a third party that is protected by the freedom of expression is protected itself. 1971 1 BvR 435/68 Mephisto judgment (Mephisto-Entscheidung) The heir of Gustaf Gründgens sued successfully the publisher of the novel Mephisto (1936) written by Gründgens’ former brother-in-law Klaus Mann to stop publishing the book. It was prohibited by all lower courts. Freedom of art is guaranteed by Basic Law, but it finds its limit in human dignity and likewise in personality right. Because freedom of art is to be construed in a broad sense, weighing up has to be comprehensive and a case by case decision. Due to a split decision the ban of the novel was upheld. It was the first decision of the court about interpretation of freedom of art. Apart from the concrete decision the court made clear that freedom of art cannot be limited by general laws. On 12 September 2012 the Court stated that the question of whether the ECB's decision to finance European constituent nations through the purchase of bonds on the secondary markets was ultra vires because it exceeded the limits established by the German act approving the ESM was to be examined. This demonstrates how a citizen's group has the ability to affect the conduct of European institutions. On 7 February 2014, the Court made a preliminary announcement on the case, which was to be published in full on 18 March. In its ruling, the Court decided to leave judgment to the Court of Justice of the EU (CJEU). Publishing of dissenting opinions in Germany is rare. Because of two dissenting opinions of justice Stein and justice Rupp-von Brünneck the impression was manifested in public, that in the future the judgment would have been different. The main point of criticism is, that the novel portrayed real actions of Gründgens during the nazi regime and thus is not able to infringe human dignity. Although Mephisto was never overturned by the court and still is the fundament for freedom of art cases, all following decisions made clear that Mephisto was a false judgment regarding the outcome. It was noticeable because despite the judgment in 1980 the Rowohlt publishing house printed 30,000 books secretly and sold it in 1981 without any promotion. Two weeks later 250,000 novels were sold. But by virtue of the expectation that Mephisto would be overturned Rowohlt was never challenged in court and judiciary still keeps quiet. Legally exact, the novel is not forbidden because there is no censorship in Germany. The judgment only prohibited the publisher in 1968, the Nymphenburger Verlagshandlung, to sell the book. Gründgens' heirs would have to sue any publisher after offering the novel based on the Mephisto judgment. 50 years later, the verdict is still valid without consequences. Due to the decision of the Federal Court of Justice that was challenged in Mephisto, the personality right of deceased people is fading through time, it is expected that Rowohlt cannot be sued successfully today. No matter if Mephisto would be overturned or not. ^ "Bundesverfassungsgericht - Library". www.bundesverfassungsgericht.de. ^ "Art. 93" [Jurisdiction of the Federal Constitutional Court] (PDF). Basic Law for the Federal Republic of Germany. Berlin: German Bundestag. April 2010. pp. 82–83. Retrieved 19 August 2010. ^ "Bundesverfassungsgericht Urt. v. 28.05.1993, Az. : 2 BvF 2/90" [Federal Constitutional Court, decided on May 28th, 1993, Case 2 BvF 2/90]. Jurion (in German). Cologne: Wolters Kluwer. 1993-05-28. Retrieved 2018-12-01. ^ "L e i t s ä t z e zum Beschluss des Ersten Senats vom 11. März 2003" [Guiding principles of the decision of the first senate, decided on March 11th, 2003]. Federal Constitutional Court - Decisions (in German). Karlsruhe: Federal Constitutional Court. 2003-03-11. Retrieved 2018-12-01. ^ "Urteil des Ersten Senats vom 15. Februar 2006" [Federal Constitutional Court verdict, decided on February 15th, 2006]. Federal Constitutional Court - Decisions (in German). Karlsruhe: Federal Constitutional Court. 2006-02-15. Retrieved 2018-12-01. ^ "Urteil des Ersten Senats vom 16. Januar 1957" [Federal Constitutional Court verdict, decided on January 16th, 1957]. Federal Constitutional Court - Decisions (in German). Karlsruhe: Federal Constitutional Court. 1957-01-16. Retrieved 2018-12-02. ^ "Elfes - Mehr als ein Urteil" [Elfes – More than a verdict]. Dissertations of the university (in German). Berlin: Free University of Berlin. 2011-01-11. Retrieved 2018-12-02. ^ "BVerfGE 7, 198 - Lüth" [Case BVerfGE 7, 198 Lüth]. Das Fallrecht (DFR) Verfassungsrecht (in German). Bern: University of Bern. Retrieved 2018-12-01. ^ "Volkszählung ("Volkszählungsurteil")" [Census (“Census Verdict”)] (in German). Hamburg: OpenJur. pp. openJur 2012, 616. Retrieved 2018-12-02. ^ "L e i t s ä t z e zum Urteil des Ersten Senats vom 12. Dezember 2000" [Guiding principles of the decision of the first senate, decided on December 12th, 2000]. Federal Constitutional Court - Decisions (in German). Karlsruhe: Federal Constitutional Court. 2000-12-12. Retrieved 2018-12-01. ^ a b c "BVerfG, Beschluss vom 24.02.1971 - 1 BvR 435/68" [Federal Constitutional Court, Court order, decided on February 24th, 1971 - 1 BvR 435/68]. BVerfG Rechtsprechung (in German). Hamburg: OpenJur e.V. 1971-02-24. Retrieved 2018-12-13. ^ a b "europarl.europa.eu: "The German Constitutional Court's ruling on the ECB's bond-buying decision" 10 Feb 2014" (PDF). ^ "Mephisto vor Gericht oder: Wie frei darf Kunst sein?" [Mephisto in court or: How free is art to be?]. Schwerpunkt: Wir Voyeure (in German). Berlin: Cicero. Retrieved 2018-12-13. ^ ""Mephisto": Die Wiederkehr des Verdrängten" ["Mephisto": the return of the repressed] (in German). Hamburg: Der Spiegel. Retrieved 2018-12-13. ^ "Vor 50 Jahren: Bundesgerichtshof verbietet Roman "Mephisto" von Klaus Mann" [50 years ago: Federal Court of Justice prohibits Roman "Mephisto" by Klaus Mann] (in German). Erfurt: Thüringer Allgemeine. Retrieved 2018-12-13. Allen, Christopher S. (10 February 2009). "Chapter 4: Germany". In Kesselman, Mark; Krieger, Joel; Joseph, William A (eds.). Introduction to Comparative Politics. Wadsworth. ISBN 0-495-79741-3. Law, David S. (2009). "The Anatomy of a Conservative Court: Judicial Review in Japan". Texas Law Review. 87: 1545–1593. SSRN 1406169. "Judgment Days: Germany's Constitutional Court". The Economist. 28 March 2009. Lenaerts, Koen; Gutman, Kathleen. "'Federal Common Law' in the European Union: A Comparative Perspective from the United States". The American Journal of Comparative Law. 54: 1–121. JSTOR 20454486. Pruezel-Thomas. "The abortion issue and the federal constitutional court". German Politics. 2:3. Johnson. "The federal constitutional court: Facing up to the strains of law and politics in the new Germany". German Politics. 3:3. Wikimedia Commons has media related to Federal Constitutional Court of Germany.